A psychic bank robber menaces National City, using her powers to trap people within their own worst fears. As Kara figures out a way to fight this new villain, James rankles under Lena's sudden ownership of CatCo Worldwide Media and the mysterious super-strong single-mother named Samantha starts a new job. Kara's refusal to tell Alex and J'onn that Psi is attacking her fears seems horribly out of character for the usually honest Kara. On that note, it beggars belief, brilliant as Lena is, that she hasn't put two and two together regarding Kara's secret identity yet. Why does Kara open up her shirt in the elevator? Shouldn't there be security cameras that could catch her doing this, even if she does change at super-speed? The slow-motion effects when Psi starts controlling the construction worker manning the wrecking ball seem forced. As a character, Ruby seems to be written as far younger than a middle-school age student. Melissa Benoist does a fantastic job conveying Kara's panic attacks. Chyler Leigh's wordless reactions to Jeremy Jordan's reassurances that everything is fine when she finds Winn and Kara in the lab together. The opening montage showing Kara, Sam, Maggie and Alex getting ready for work in the morning is well-shot and set to an interesting song. The music and camera distortion used when Kara starts to freak out after being attacked by Psi are quite disturbing and efficiently used. The elevator sequence, which ends with a desperate Kara breaking through the roof of the Catco Worldwide Media building in order to get out into the open air, is particularly well-realized. The script does a fantastic job of establishing Kara's reactions as typical of an anxiety attack and Winn's telling her that it's nothing to be ashamed of is a beautiful moment. 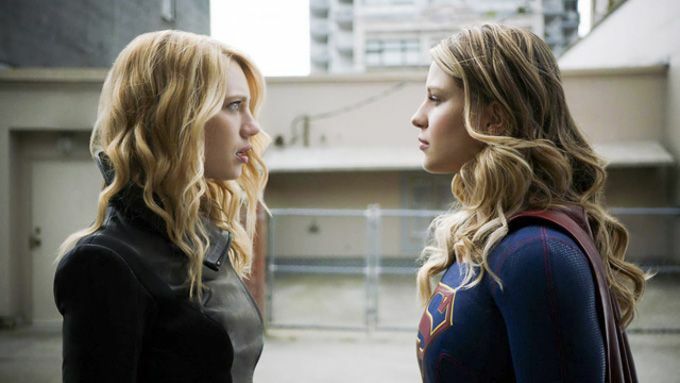 The episode does not open with the usual opening with Kara explaining how she came to Earth as a teenager. As Samantha says, there have been reports of people displaying temporary super-strength in order to lift heavy objects to save lives. Sadly, there's little verifiable evidence for these stories and even less success at replicating these effects in a controlled environment. While it is possible for a "flight-or-fight" response to temporarily increase a person's physical attributes thanks to deadened pain responses and an adrenaline rush, the factor of the increase is relatively minute. So as much as we'd like to believe the urban legend of the 120 lbs. mother dead-lifting a flipped SUV off of her baby, there's no basis in reality for it. The character of Psi was created by Paul Kupperberg and Carmine Infantino and first appeared in The Daring New Adventures of Supergirl #1 (November 1982). Originally a girl named Gayle Marsh, Psi developed psychic powers at the age of 12. Following the death of her parents, she was raised by a scientist who warned her of the approach of an enemy called The Decay. She fought Supergirl several times, thinking Kara Zor-El was The Decay in disguise. Eventually, Psi realized that the man who raised her was an illusion created by her powers - an extension of her own fears. She later joined The Suicide Squad in an effort to gain control of her powers but died on a mission. In The New 52 reality, Psi made a brief appearance in the Forever Evil storyline. Her background was not specified beyond her being a prisoner in a secret ARGUS facility in Detroit known as The Circus. A character called Psi appeared in the seventh issue of the New Adventures of Supergirl comic based on the CW show. This Psi was a prison guard at Fort Rozz, tasked with using her psychic powers to keep the most violent inmates subdued. Left as a being of pure spirit following the destruction of Fort Rozz, she turned upon Supergirl, whom she mistakenly blamed for hurting her friend Rampage - an innocent unjustly imprisoned in Fort Rozz, whom Psi had come to view as a friend. The DCTVU version of Psi has the name Gayle March, like her original comic book incarnation. Rather than being an aspiring superhero, however, she's a thief. Like her comics incarnation, she is a powerful telepath and a telekinetic. The bank where Supergirl first confronts Psi is located on 25th and Cedar Street. The number 25 is a reversed 52 - a number frequently included in various DC Comics properties. Cedar Street could be a nod to Michael Cedar, who was a producer on the first season of Supergirl. J'onn can't read Kryptonian minds but he can detect signs of residual psychic activity. Martian telepathy differs from human psionic powers in some technical way that J'onn does not describe beyond psychic metahumans producing a certain kind of psionic interference. Winn creates a device (a.k.a. Psionic Inhibitor Red) he thinks will be capable of blocking Psi's powers so Supergirl can get close to her. It isn't. Rubies are the strongest gemstones after diamonds. On Mohs 1-10 Scale Of Hardness, diamonds are ranked 10 and rubies are ranked 9. Supergirl: I got you cornered. Psi: (not looking up or turning around) Do you? Supergirl: What did you do them up there? Psi: (slowly turning around) I only wanted to play. But they didn't want to play with me. Supergirl: Well, you're not getting away with it. Psi: Oh! (smiles softly) You think you're the cat and I'm the bird. (she turns and zips her bag shut, shouldering it as she looks to Supergirl) You got it backwards. You could join me. Maybe then you'd be happy. You see, money equals happiness. More money? More happiness. Supergirl: Your priorities are seriously out of whack. Supergirl: Put the bag down. Kara: How am I supposed to deal with that? Alex: Well... by remembering that your fears don't define you. You know, who you are as Supergirl? Who you are as Kara? That's what defines you and she'd got nothing on that. Kara: No... who I am as Kara feels broken. (sighs) I lost Mon-El. Lena keeps asking me where I'm going, which is new and horrible. Alex, I'm trying to be myself again but everything that used to make me feel good like... like a relief? It's - it's disappeared! Alex: It's not always going to feel like that. I promise. Kara: My life as Supergirl is the one thing I can count on. I can go out there and help people. I can make a difference in the world. I can... feel strong even though a huge part of me feels so weak and she's taking that away from me. (pauses) And if I don't have Supergirl, what do I have? Lena: This is new for me too. Lena: No. Having friends. We Luthors don't have friends. We have minions. Ruby: Do you know how many people in this world want to have superpowers? Do you know how special it is? Sam: No, I'm not! I'm just an average mother trying to take care of her kid! Eve Teschmacher is a Lena Luthor fangirl. Lena takes her coffee black and hates salmon. Despite Cat Grant having been absent from the CatCo building for the better part of a year, Eve still does not use her private "boss only" elevator. It was a Danvers' family tradition to get a new planner on the first day of school. Lena says it was a Luthor family tradition to start the school year by hiring a private investigator to check that their teacher's credentials were up to date. There's a chance she might be joking about this. Winn and Maggie favor live bands for wedding entertainment. J'onn and Alex favor DJs. Kara is on the general alert "distro" list at the DEO. Normally only analysts get general alerts, but Kara wanted to know about everything that was going on as it came in. Kara had episodes stemming from claustrophobia after first arriving on Earth. This stemmed from her feeling trapped in her rocket while witnessing Krypton's destruction. It is these fears that Psi tapped into in order to paralyze Kara, as well as her worry that she sent Mon-El to his death by shooting him into space. J'onn attempts to create a psychic shield to protect Kara from Psi's influence. Psi proves to be too powerful for him. He later says that Psi is the most powerful psychic he's ever encountered. Ruby gets into a fight with another girl at her school after claiming her mother has superpowers. Kara makes use of a Kryptonian meditation technique to calm her mind. She has not done this since coming to Earth since she never felt the need to before now. It is revealed that Psi does not read her subject's minds - she merely triggers the fear response. We discover this when she asks what it was that made Supergirl so afraid. Alex recognizes Ruby from 301. Alex and Maggie never discussed having children. Alex wants to have kids someday. Maggie says she never saw herself being a mom. At the end of the episode, it is revealed that Sam's new job is as the new CFO of L-Corp who is running things while Lena is learning how things work at CatCo. Sam attempts to bend a crowbar once she is home. She fails to do it. J'onn receives a psychic message from M'Gann, telling him he has to return to Mars. One of the most powerful psychics in the DC Comics Universe, J'onn has his powers severely curtailed here in order to make Psi more of a threat. Protecting another person with a psychic shield would hardly tax the Martian Manhunter of the comics. Here, J'onn is knocked out by Psi in less than a minute as he tries to shield Kara. Oddly uneven, but largely enjoyable. The performances are great, the effects-work wonderful and Psi is well-realized as a menace but it seems shameful for a character like Psi who has a lengthy history with Supergirl in the comics being reduced to a villain-of-the-week as she is here. The larger problem, however, is the Ruby and Sam subplot. Ruby seems to be written far younger than her actress would indicate and there's very little that is engaging about Sam as a character at the moment. You know it's a bad sign when you wish more of the episode had focused on James dealing with Lena taking over his role as Grand Poobah at CatCo than on watching Ruby put herself in danger in an effort to prove her mom has powers.